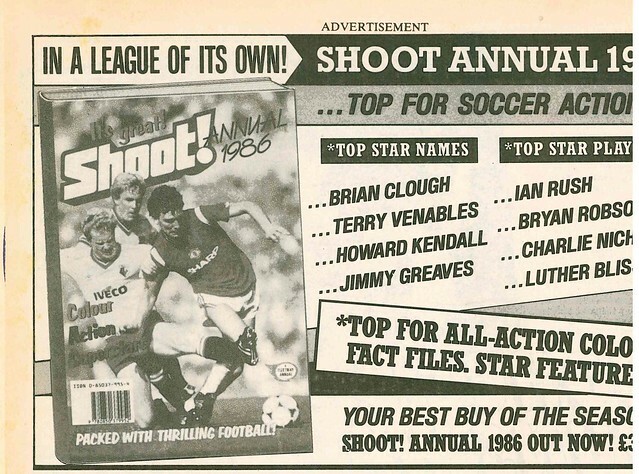 Glenn Hoddle of England is the cover star of this edition of Shoot. 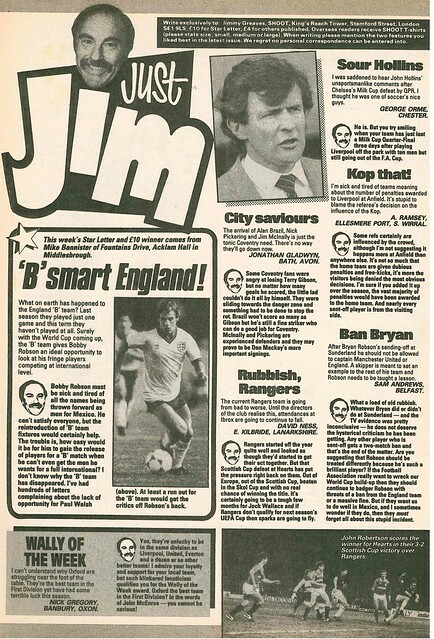 Or perhaps, not of England, if the headline is anything to go by. 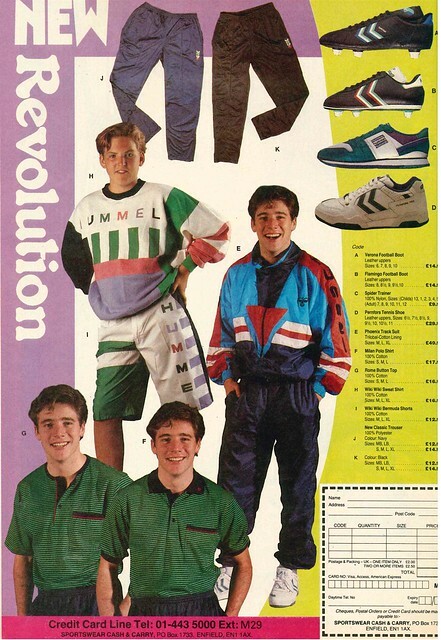 This was also the week in Back To The Future II where Marty McFly visits 2015. 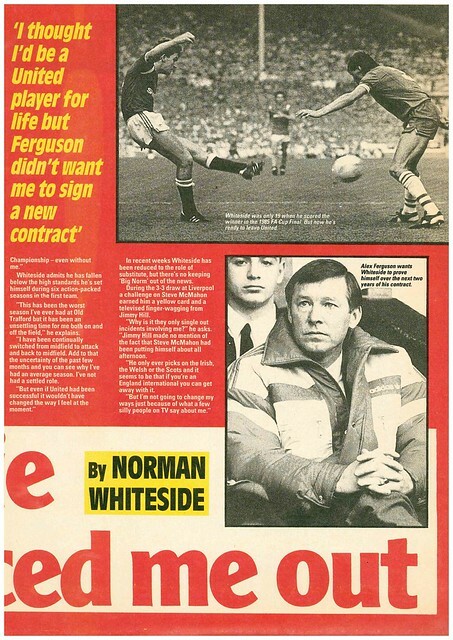 As you open the magazine, there is a double page spread on Steve McMahon, who has just joined Liverpool from Aston Villa, nearly three years after rejecting Liverpool to go to Villa Park. 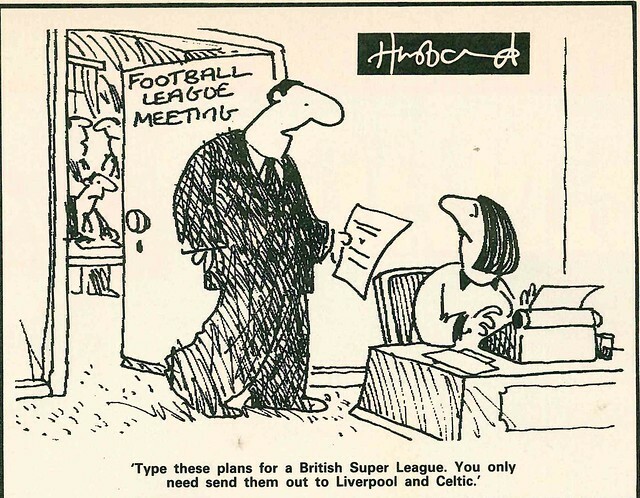 Meanwhile, there are reports that England’s top clubs could be forming a breakaway Super League. 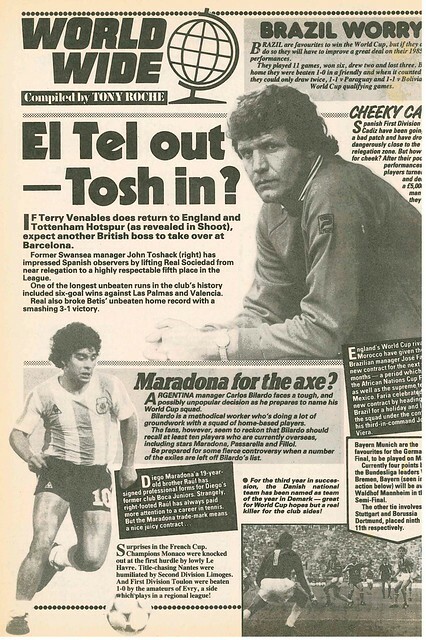 Cover star Glenn Hoddle is interviewed, finally becoming an England regular, and is confident of returning home from Mexico the following summer with the World Cup. 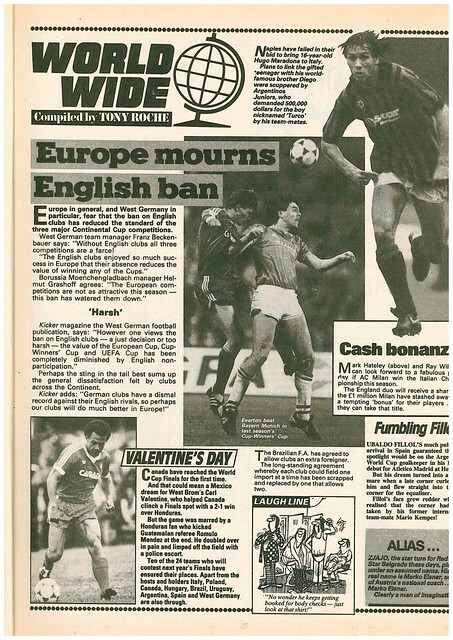 The cover headline “I’LL QUIT ENGLAND” refers to his club status, as he expresses his desire to play on the continent, which he did in 1987 when he signed for Monaco. 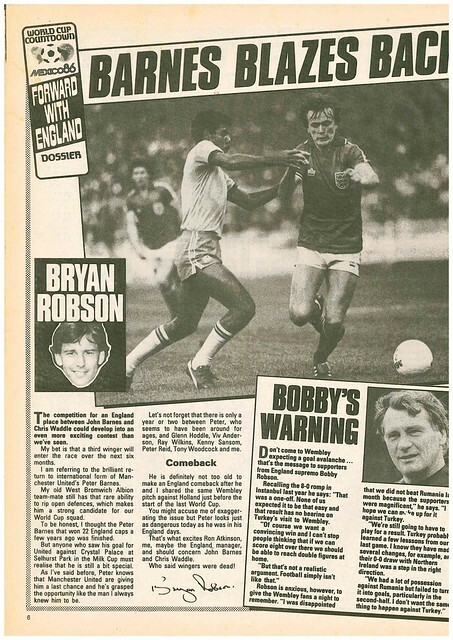 Bryan Robson uses his column to state that Peter Barnes is worthy of a place in the England squad to provide competition for John Barnes and Chris Waddle. 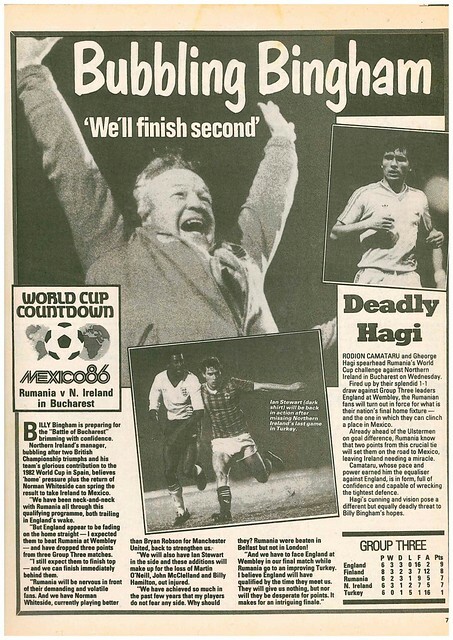 Northern Ireland’s vital World Cup Qualifier away to Romania gets previewed, with manager Billy Bingham confidently predicting that Northern Ireland will finish 2nd in their group and head to Mexico. 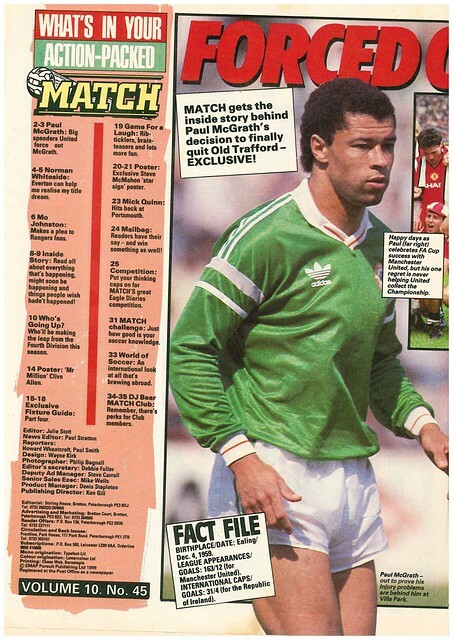 Republic Of Ireland also have ambitions of going to Mexico, and have blooded Tony Cascarino into their squad in time for their vital game away to the Soviet Union. 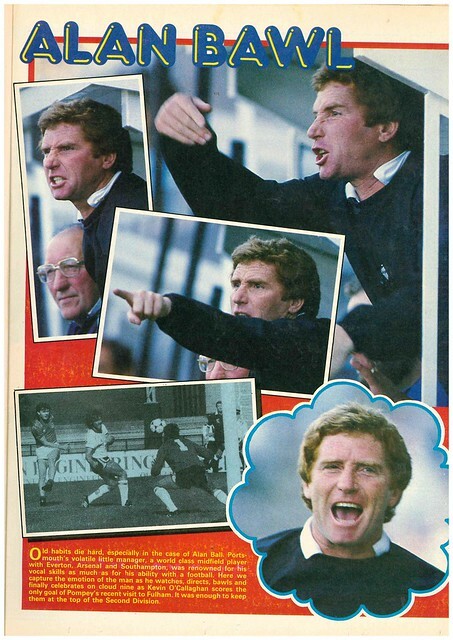 Portsmouth manager Alan Ball gets a photo collage, as he aims to lead the club back to the top flight of English football. 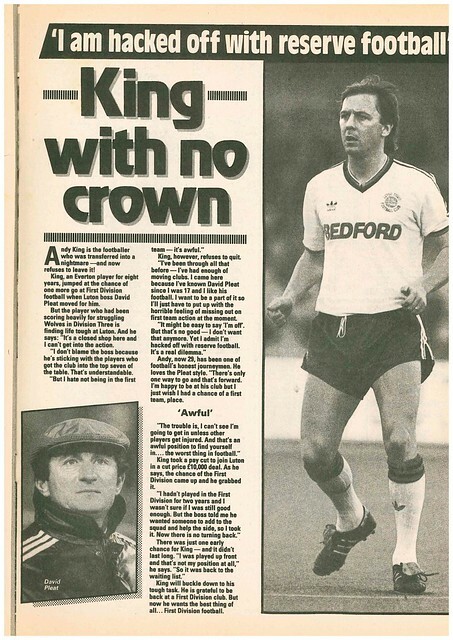 West Germany manager Franz Beckenabauer feels this season’s European club competitions have been devalued by the absence of English clubs, while Canada have qualified for the World Cup for the first time in their history. Meanwhile, Napoli failed in their bid to sign Hugo Maradona from Argentinos Juniors, the younger brother of Diego Maradona. 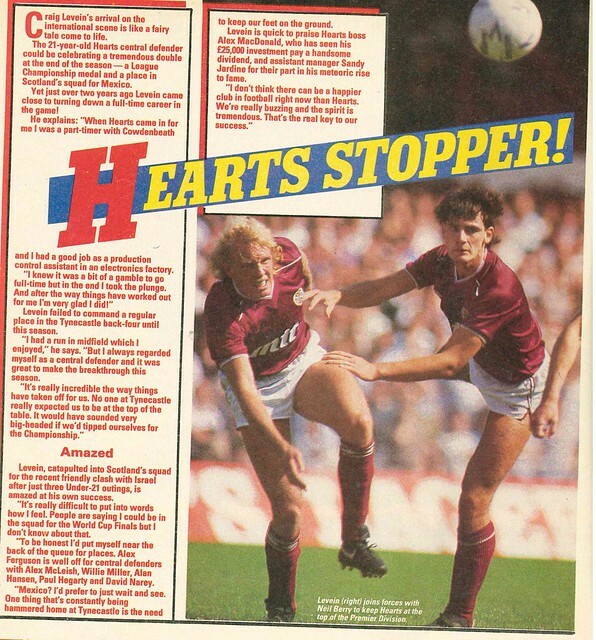 A dispute between the governing body and broadcasters meant that there were no games on TV, so Shoot did a double page photo collage of the best strikes. 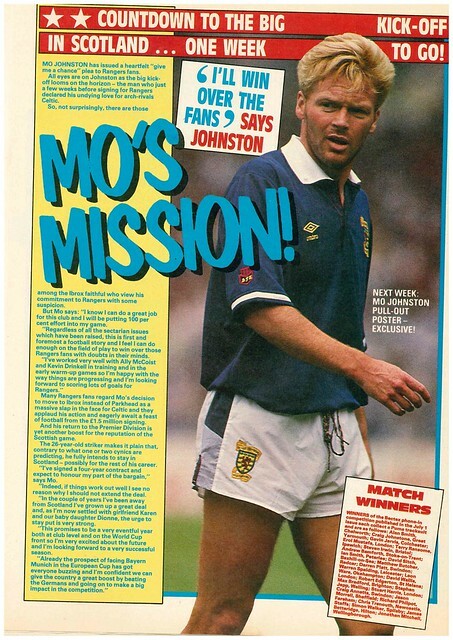 In Scotland, there is a full page profile and a poster of Celtic. 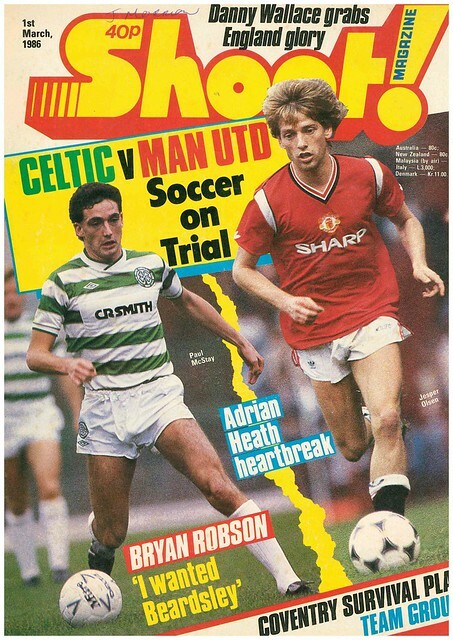 In Wales, Mark Hughes was set to miss the opening games of Euro 88 Qualifying, due to a red card in an underage Euro qualifier against Yugoslavia in 1983. 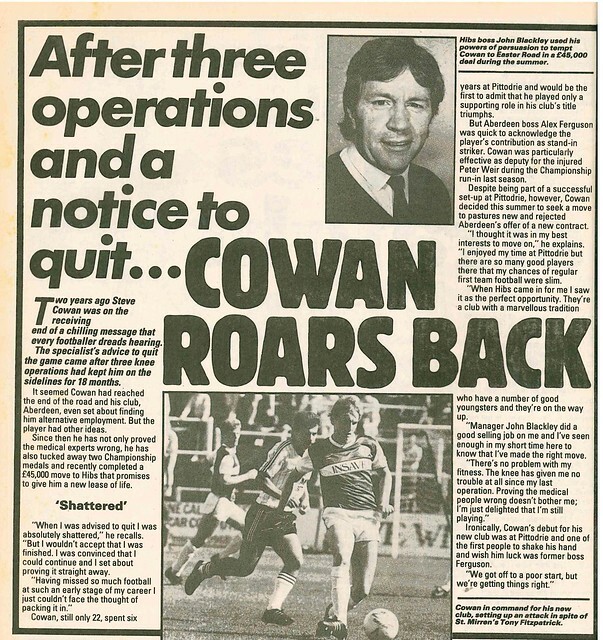 Steve Cowan gets a full page feature, having just signed for Hibs and is hoping to put his injury problems behind him. Bradford City get featured, as the club tries to recover from the tragic fire at their ground five months earlier. 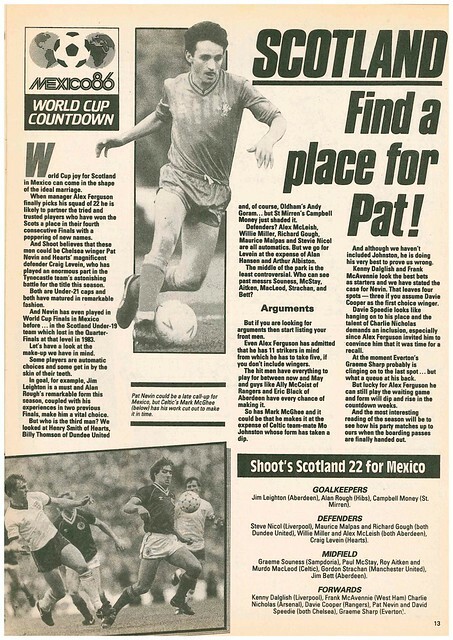 Peter Reid uses his column to talk about Everton’s problems conceding goals, especially in the early moments of games. 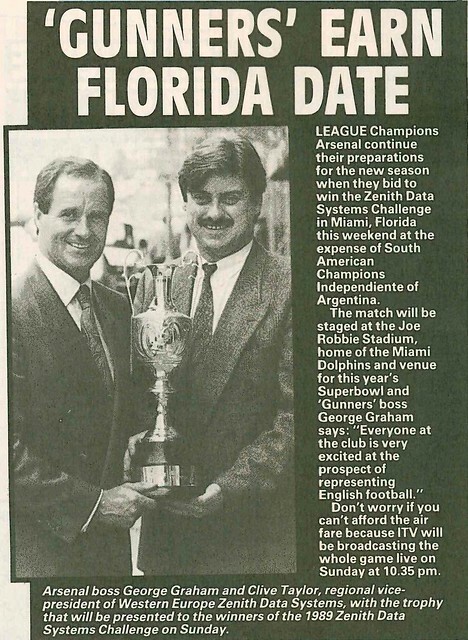 Reid’s Everton team-mate Gary Lineker is happy, having found a Snooker Club near his home in Southport, and has managed to convince Willie Thorne to start supporting Everton. 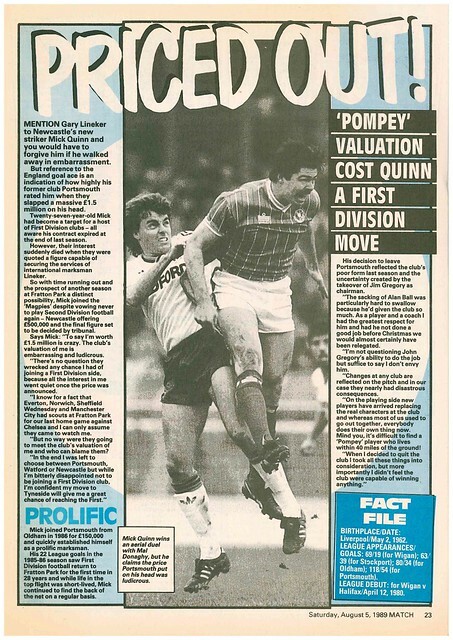 Meanwhile, Portsmouth are trying to sign Paul Mariner from Arsenal. 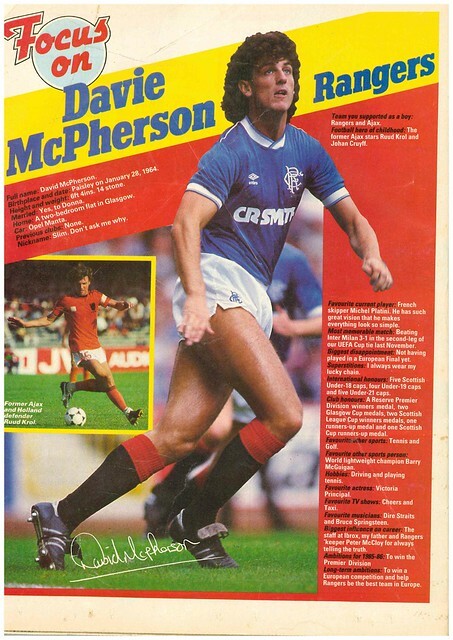 The magazine ends with a profile of Davie McPherson of Rangers. His favourite music is Dire Straits and Bruce Springsteen. 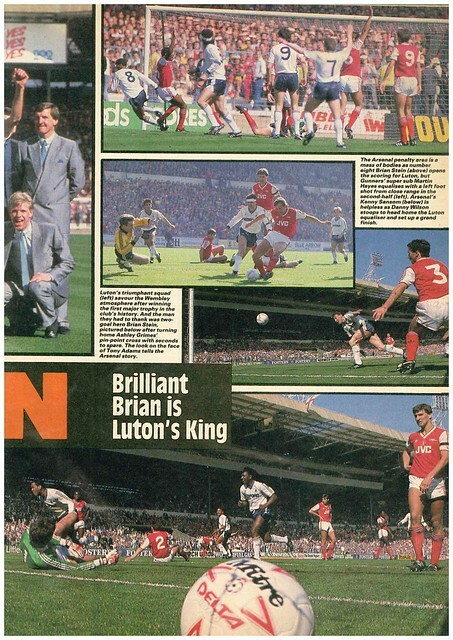 Luton Town are the cover stars of Shoot, as the 1988 League Cup Final gets reviewed. 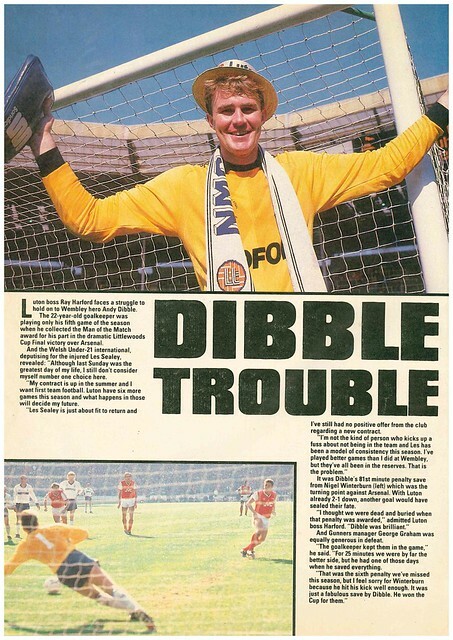 Luton’s 3-2 win over Arsenal gets three pages of coverage, with a full page dedicated to penalty save hero Andy Dibble, who is attracting transfer interest after deputising for the injured Les Sealey. 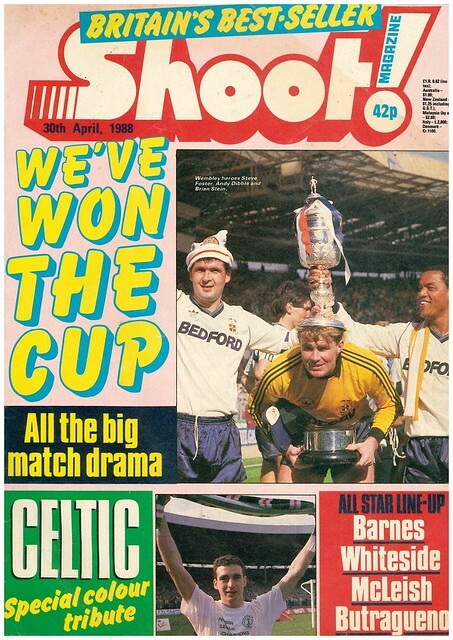 Also celebrating a trophy win are newly crowned League Champions Liverpool, which gets a full page feature. 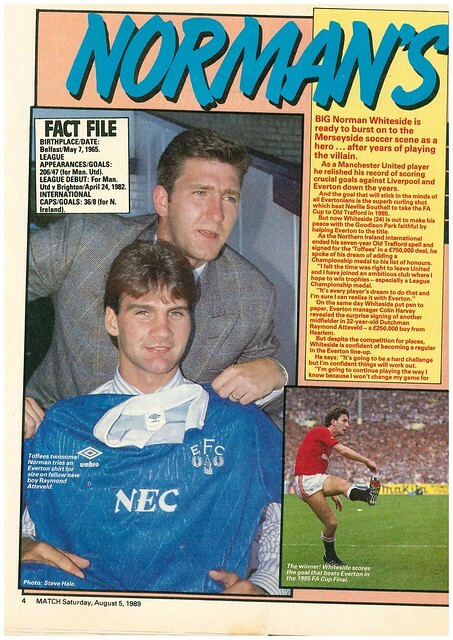 Norman Whiteside looks set to leave Manchester United after a contract dispute. 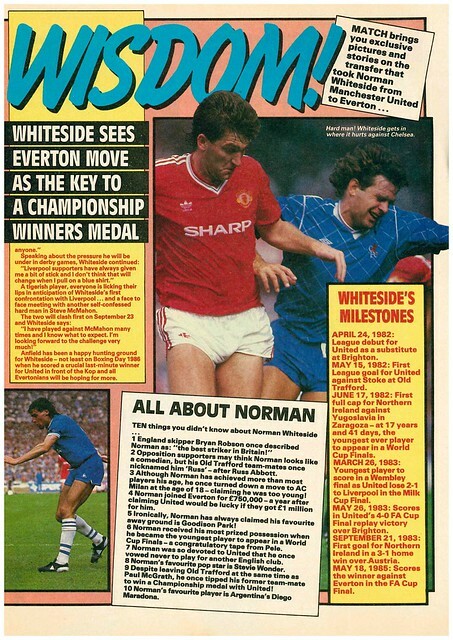 Whiteside also has a go at Jimmy Hill for his scrutinising of tackles by non English players in the aftermath of criticism by Hill of a tackle by Whiteside during a recent game at Anfield. 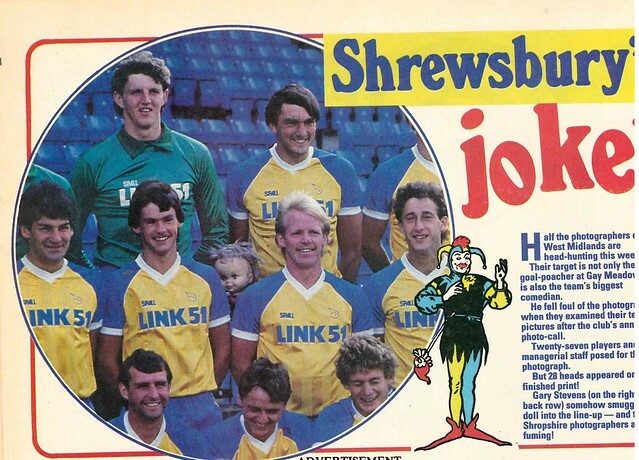 Shoot prints out a handy guide for the Football League Play-Offs, in their second season. 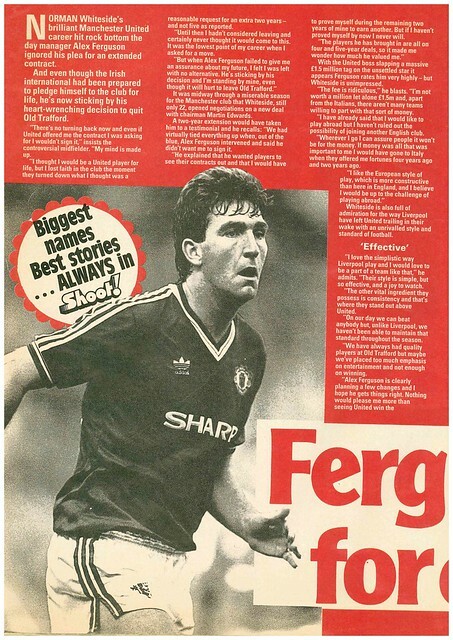 John Barnes uses his column to pay tribute to Peter Beardsley. 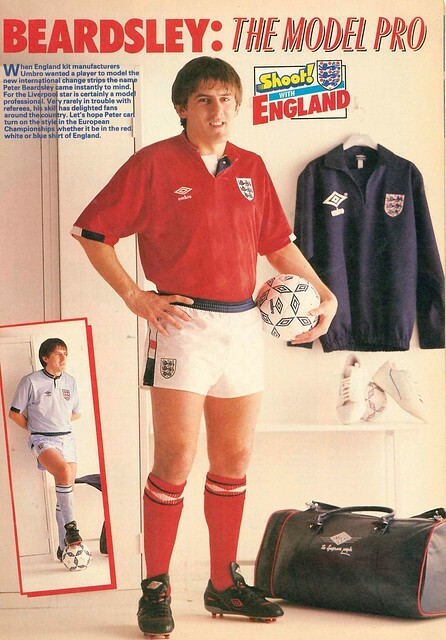 Talking of Peter Beardsley, he is modelling the new England kit for Euro 88. 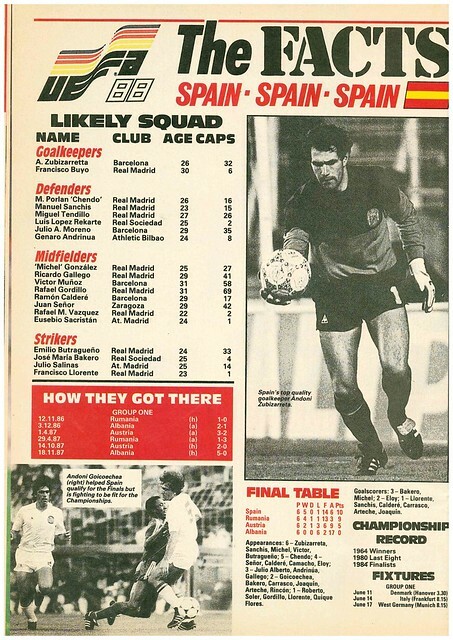 And talking of Euro 88, there is a four page profile of Spain. 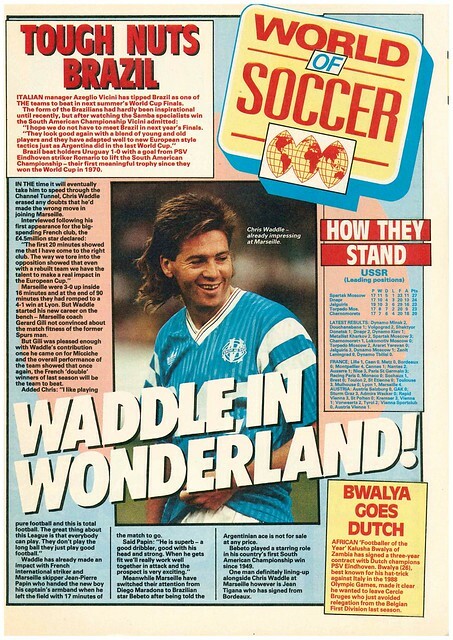 In world news, Inter Milan want to sign Lothar Matthaus, while FIFA are threatening to take the 1990 World Cup away from Italy and award it to West Germany after the preparations have fallen behind schedule. 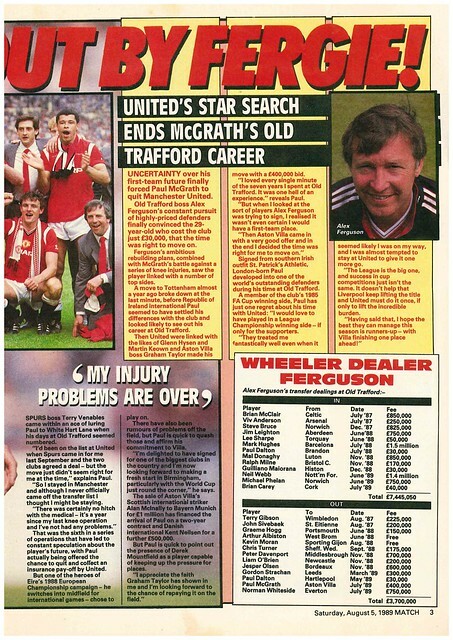 There is a double page feature on two teenage players who have broken through in Division One – Michael O’Neill and Alan Shearer. 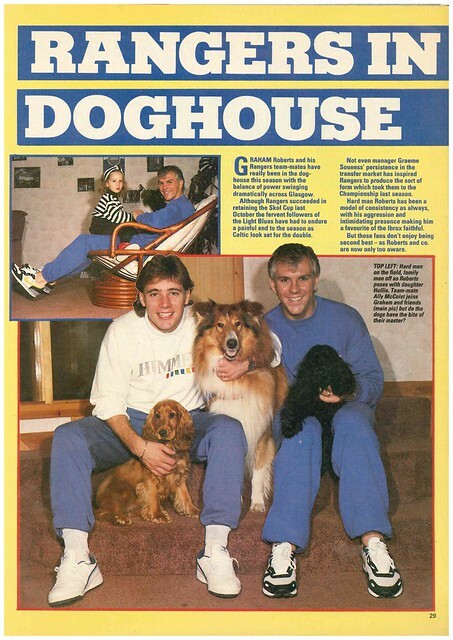 Rangers fans who love dogs were in for a treat as Shoot do a feature on Ally McCoist and Graham Roberts love of dogs. 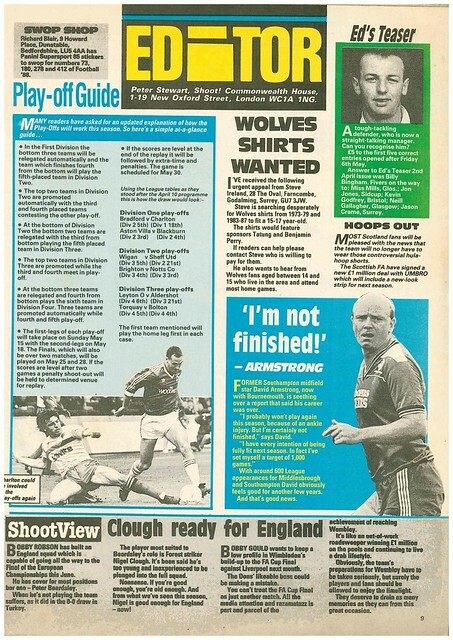 Bryan Gunn gets interviewed and tells Shoot that Norwich players are responsible for the poor run of form that saw the departure of manager Ken Brown. 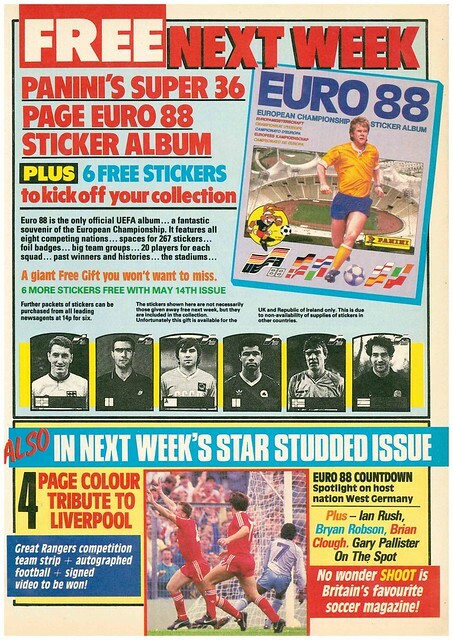 There is an advert for the following week’s edition of Shoot, which has a free Euro 88 sticker book. 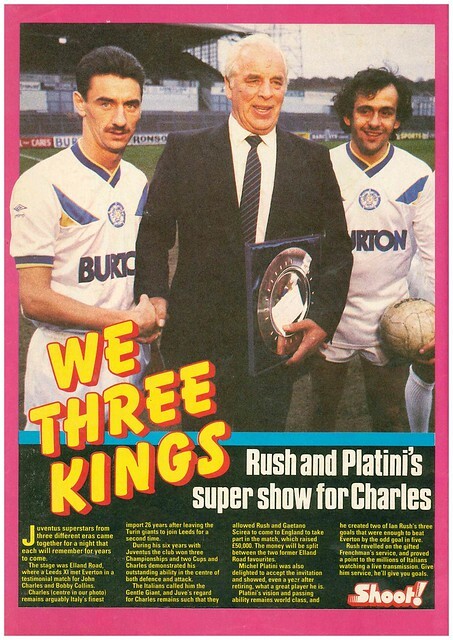 The magazine ends with a feature on John Charles Testimonial Match, which saw Ian Rush and Michel Platini make guest appearances for Leeds United, though Rush would go on to sign for Leeds eight years later. 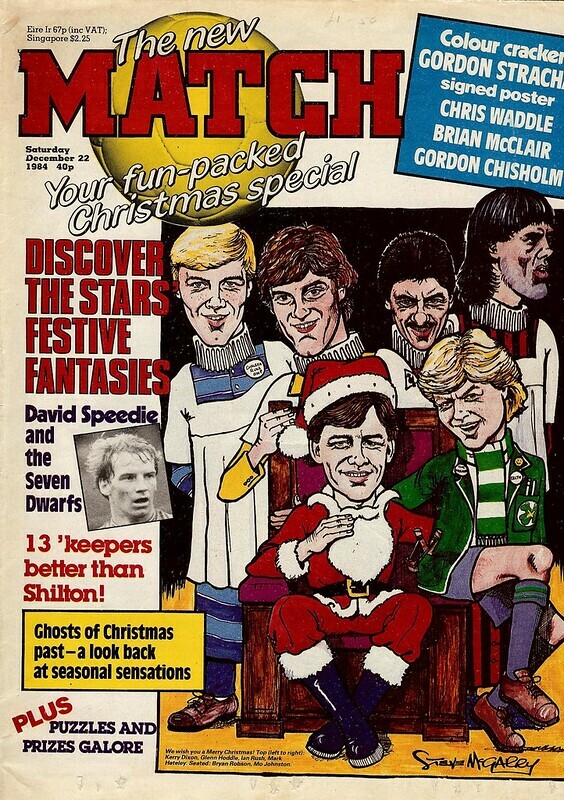 It’s Christmas 1984, and Match gets in the festive mood, with a cartoon of Bryan Robson as Santa, and Kerry Dixon, Glenn Hoddle, Ian Rush and Mark Hateley as choirboys with their uniforms in their respective club kits, while Mo Johnston is a schoolboy meeting Santa. 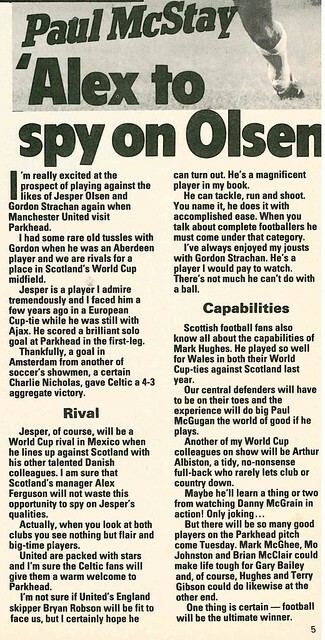 A double page feature asks a series of stars what their ideal Christmas would be. 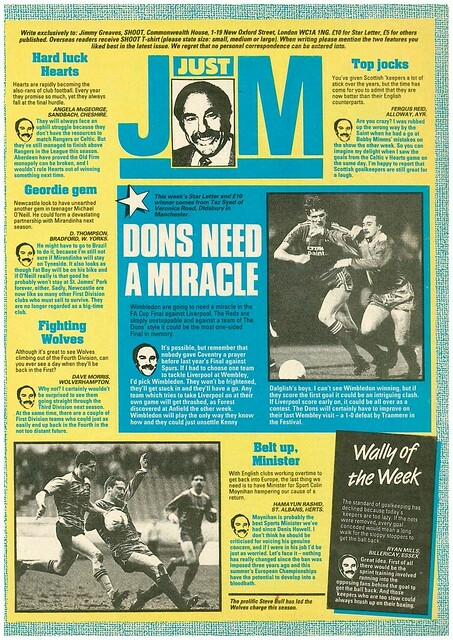 John O’Neill of Leicester City’s ideal Christmas is Midnight Mass, take delivery of BMW 635, take Felicity Kendall out for a spin, then head to Switzerland for a holiday. 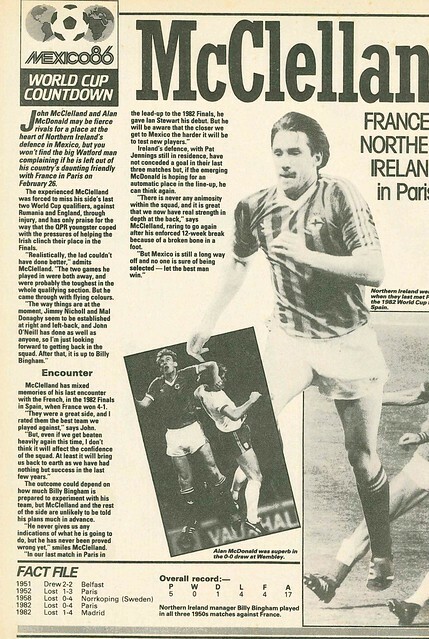 Steve McMahon also wanted to be on holiday in Switzerland. 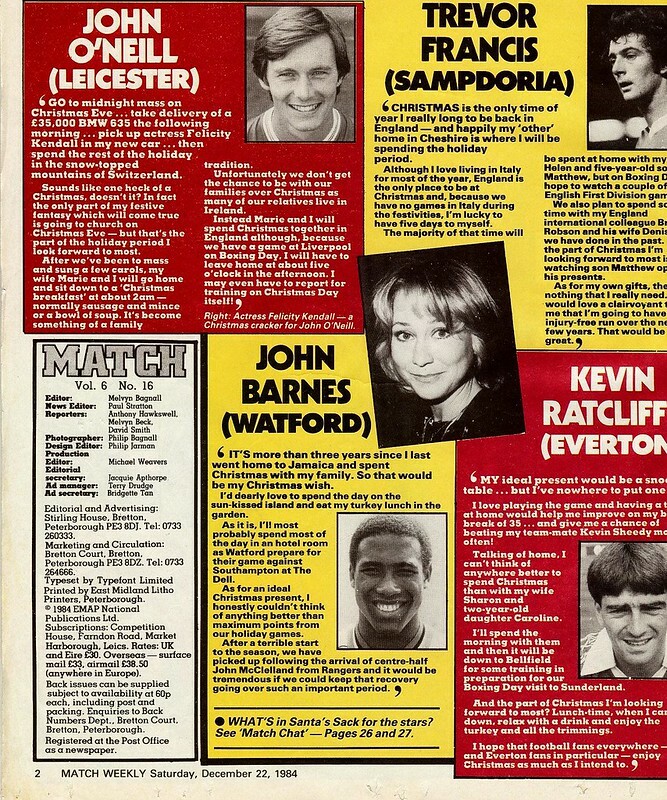 John Barnes would like a holiday to Jamaica for Christmas, while Kevin Ratcliffe wants a Snooker table. 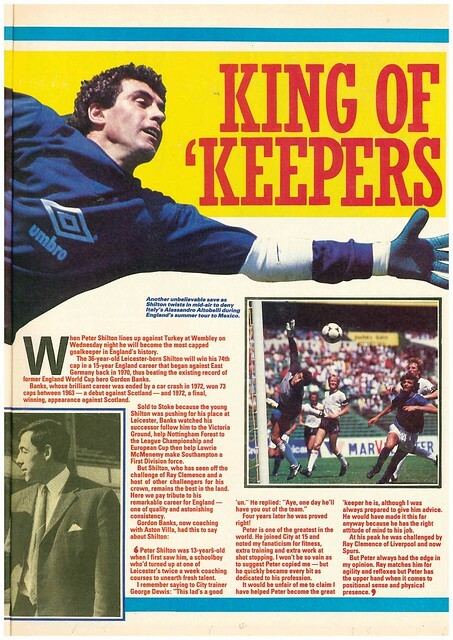 One person who has want they want for Christmas is Trevor Francis. Based in Italy with Sampdoria, he was planning to take advantage of Italy’s mid season break to go back to England over the holiday period, and wanting to watch a Division One game on Boxing Day. 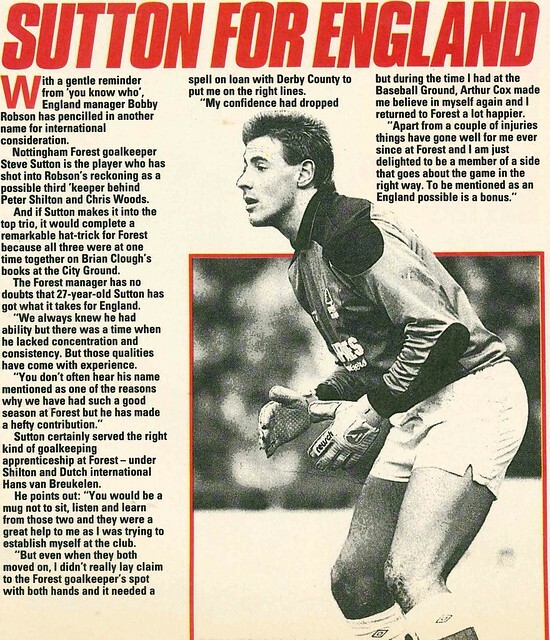 He also won a talent competition at Butlins when he was younger for doing impersonations. 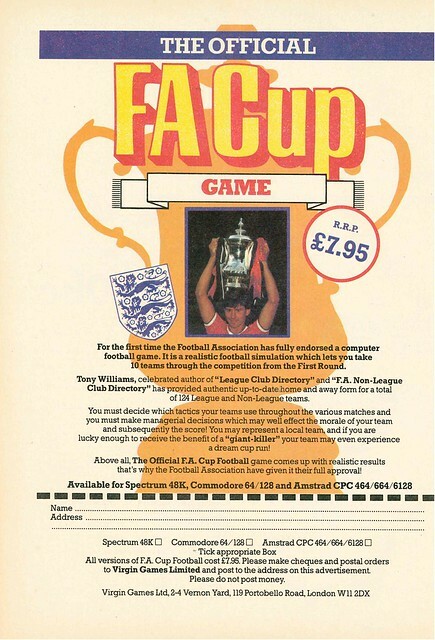 Match gives a double page spread to a recent FA Cup 2nd Round tie between Bristol City and Bristol Rovers, which Rovers won 3-1, in front of a crowd of 20,000 – more than double any FA Cup crowd that day. 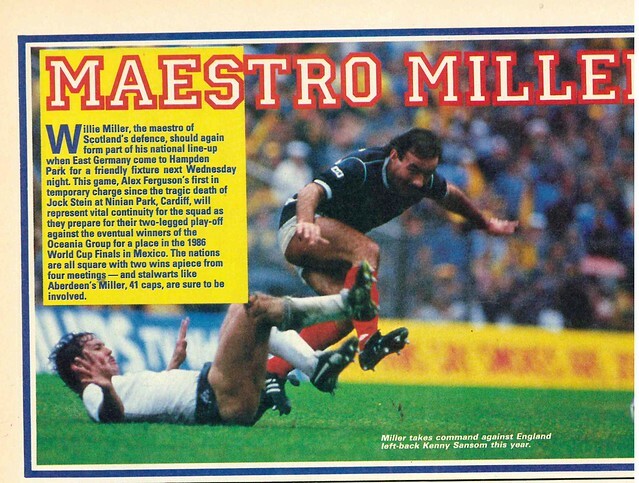 In the middle of the magazine, you could get a centre page poster of Gordon Strachan. 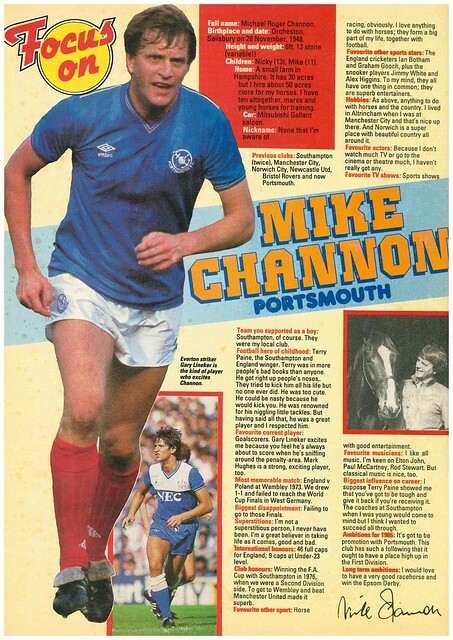 Clive Allen gets a Q and A. Kenny Dalglish is his favourite Football League player, while Michel Platini is his favourite foriegn player, and includes David O’Leary and Mark Lawrenson in his British XI. He also dislikes smoking and bad drivers. 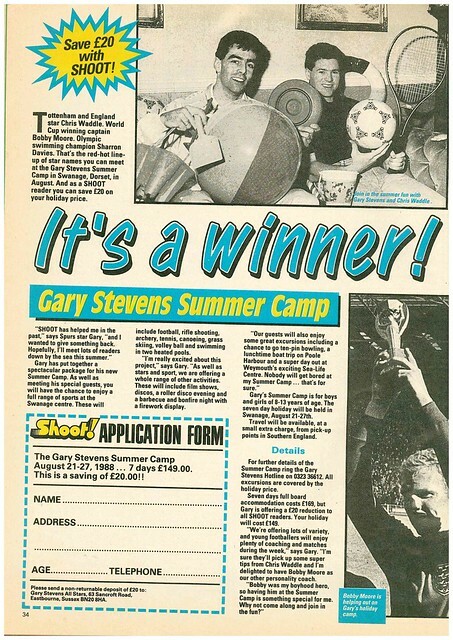 Ever wondered who Clive Allen’s favourite pop star is? 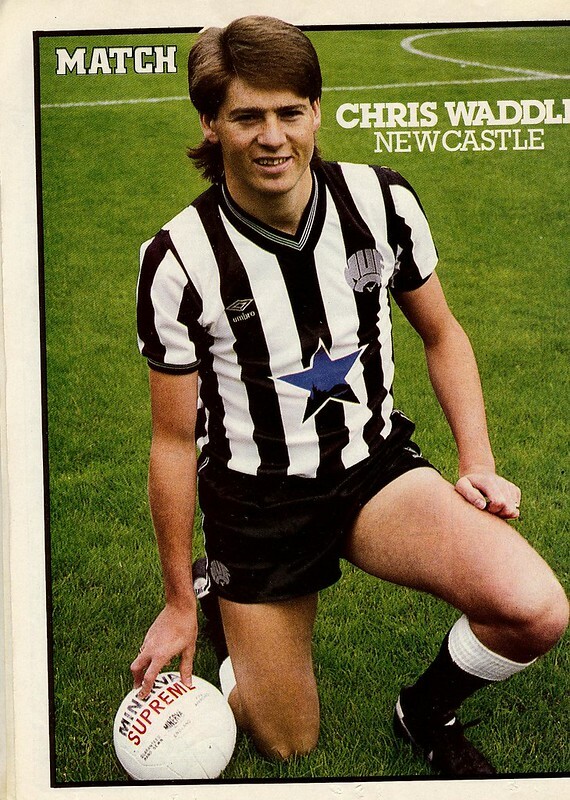 Christopher Cross. 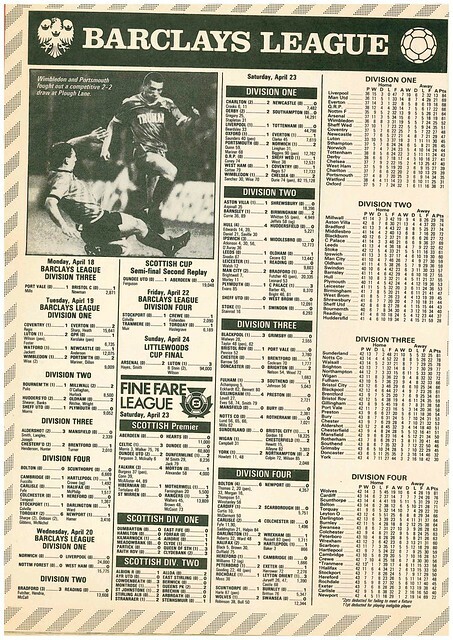 In League tables, Everton, Tottenham Hotspur, Manchester United and Arsenal were seperated at the top of Division One by two points. Liverpool were 8th, 9 points off the top. 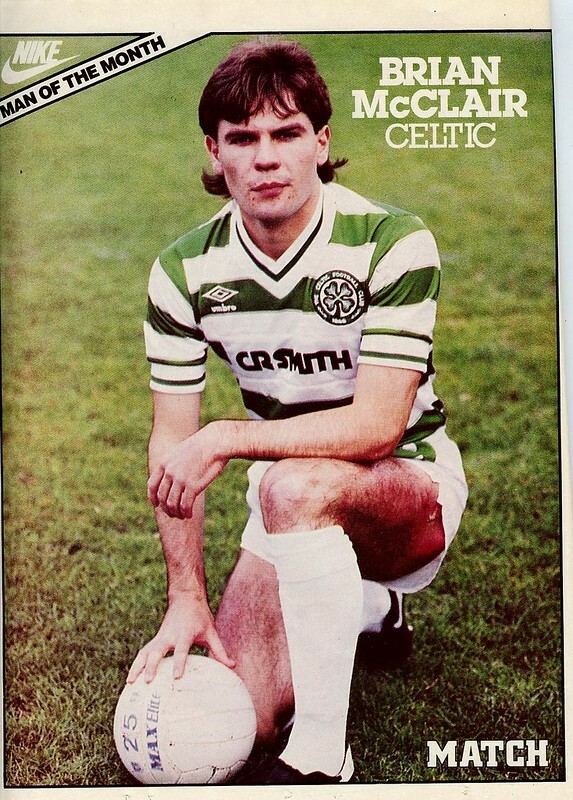 Brian McClair of Celtic got a poster, his reward for being Nike’s man of the month. 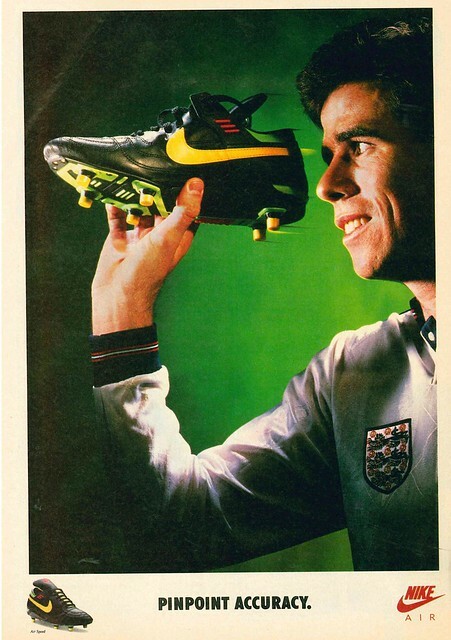 Interestingly, 1984-1985 was the first season and English club wore Nike. 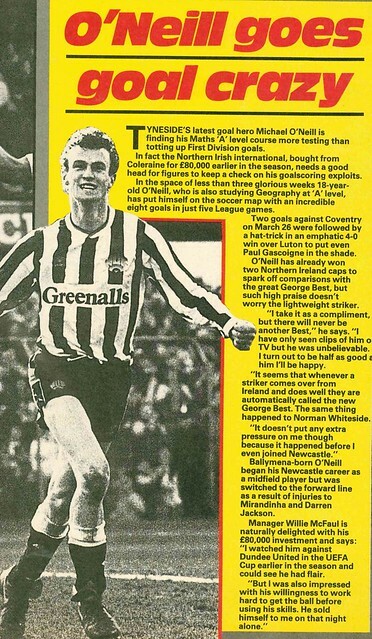 Sunderland, since you ask. 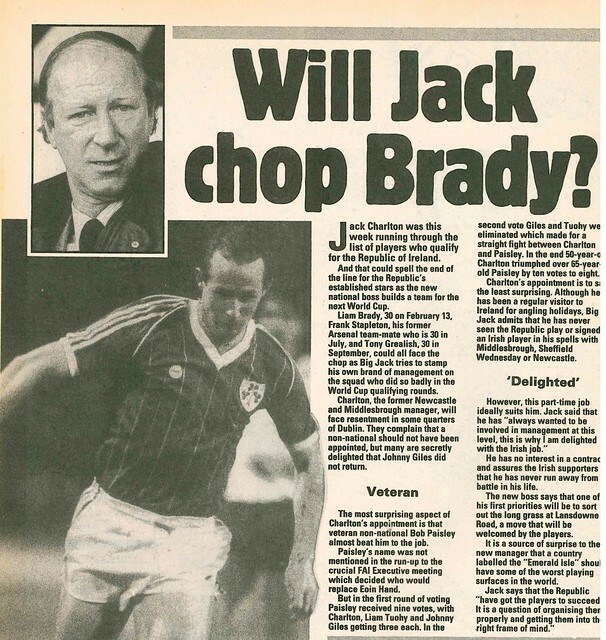 The foreign news feature reports that Giorgio Chinaglia is planning a comeback at the age of 38, while Steve Archibald is in goalscoring for for Barcelona, and Fortuna Dusseldorf have asked their players to take a wage cut.